Starring Cate Blanchett, Jack Black, Owen Vaccaro, Lorenza Izzo, Kyle MacLachlan, Colleen Camp, Sunny Suljic, and Renée Elise Goldsberry. 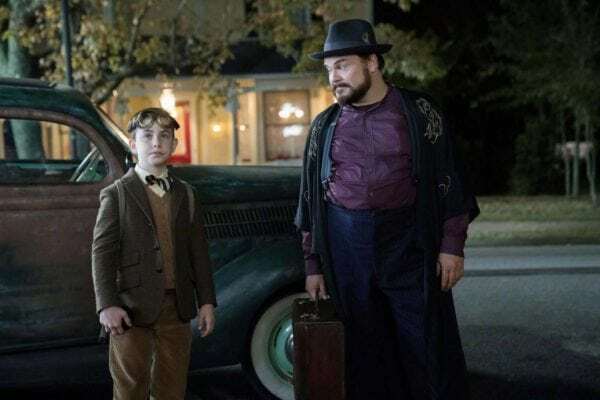 Jack Black isn’t starring in Goosebumps 2: Haunted Halloween, but is starring in a movie that might as well be a Goosebumps sequel itself – Eli Roth’s The House With A Clock In Its Walls? R.L. Stine-isms, child accomplices, magical creatures and all. Roth steps outside his blood-spattered “comfort zone” to tell a bedtime story about nurturing magnificent weirdness, one fluent in gothic haunted mansion mystique. Family friendly, PG-rated horror fare is in short order these days, and while Goosebumps set the recent bar out of nowhere only a few years back, Roth’s Pleasantville gone cauldron-happy will entertain audiences in just-dark-enough order. Can you truly bungle a spell that includes pinches of Jack Black and Cate Blanchett, anyway? Enchant away! Owen Vaccaro stars as Lewis Barnavelt, a dictionary-obsessed youngster forced to move in with his uncle Jonathan (Jack Black) in New Zebedee, Michigan after the death of both parents. His uncle’s house is filled with hidden nooks, and it’s not long before Lewis learns a family secret – Jonathan is a warlock. Their neighbor, Mrs. Zimmerman (Cate Blanchett), is a well-studied witch. 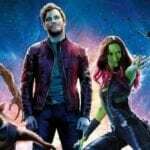 Jonathan’s house, left behind by once-friend Isaac Izard (Kyle MacLachlan) – another warlock – ticks and tocks with each passing second thanks to a curse Izard left to taunt Jonathan. Lewis takes to his new surroundings and Jonathan teaches beginner warlock lessons, but as a lunar eclipse approaches, the trio uncovers a far more dangerous reason for Izard’s hidden clock. Cue the doomsday countdown! The House With A Clock In Its Walls is never better than when Black and Blanchett jab each other with barbed insults (“go braid your back hair” or purple skeleton comparisons), and nowhere near as lively without them. Lewis’ run-ins with greaser-esque class president Tarby Corrigan (Sunny Suljic) evoke the personality of after-school bullying specials. Vaccaro’s Poindexter “Young Sheldon” riff melds unenthusiastically with Roth’s command of schoolyard values, as generic an outcast story as they come. Torn from John Bellairs’s page with monotone appeal. Black and Blanchett – with Vaccaro as their bow-tied apprentice – are a dream team of playful quips and ultimate wonder. Black, the Orson Welles of warlock exuberance who conjures planetary diagrams and rocks his saxophone (poorly) at 3AM like a madman. Blanchette, the tall, posture-perfect intellectual who’s prim-and-properness suggests the Mary Poppins of witches. Together, their opposites-attracts (totally platonic) schtick shows Lewis how “weirdness” is what makes him an individual – the secret ingredient in Mrs. Zimmerman’s fresh-baked cookies are a few nuts, after all. Whether Black’s scolding winged lion shrubbery pets or Blanchett’s blasting jack-o-lantern attackers with energy-bolt umbrella rounds (like a Tommy gun), these two powerhouse performers take to 70s small-town television serial vibes with delightful ease. Charming, wonder-filled, and wholly believing in Roth’s world. 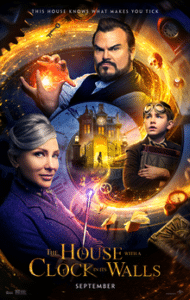 Effects are safe and CGI-heavy – mainstream dependability – but The House With A Clock In Its Walls unearths “creepy” accents in short bursts. Be it Izard’s leftover collection of metal animatronic statues – clowns to human hybrids to suited devils – or Izard’s eventual inclusion, Roth pushes as far into PG realms without crossing all-ages boundaries. 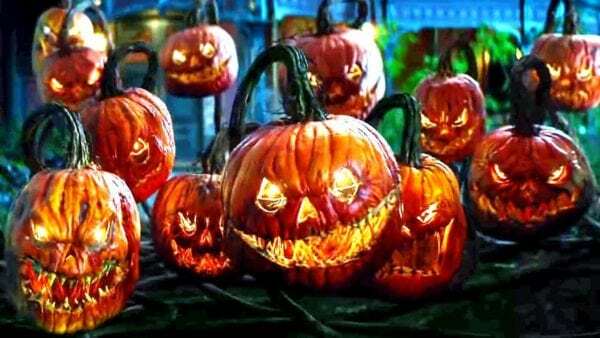 Fanged pumpkins don’t chomp into victims, they puke seed-flecked adhesive goo. Humans don’t die, Izard winds back a generational clock. When inside the gates of 100 High Street, Roth unleashes his inner child. Maybe a bit low-brow as far as leafy diarrhea jokes are concerned, but we live Lewis’ excitement as overgrown snakes and dog-like armchairs and morphing stained-glass portraits interact with their dumbfounded houseguest. Halloween-trickster treatment to the fullest. That’s really all there is to The House With A Clock In Its Walls, and serviceably so. Jack Black waves his hands in an orb-shaping motion as combusting flickers ball within his grasp while Cate Blanchett’s pun-perfect sophistication paints her lifelong compadre into a corner with such refined excellence. Eli Roth operates with maximum whimsy but stuffier dramatic regard, summoning a respectable family haunt at its best when embracing every ounce of “weirdness.” Don’t worry, Black gets to over-annunciate verbiage like “tootsies” and cry like a literal baby (nightmares) – you’ll be fine.